Organization and keeping things tidy have never been my strengths. Being an artist gave me an excuse to be messy. When I'm painting, order is not a high priority, so I was not that bothered by my messy art studio... well not too much. I would have times of "cleaning" my studio but in reality I just cleaned surfaces and rearranged things. I hid stuff in boxes, drawers or cupboards. There may have been a semblance of order or cleanliness but I knew better. 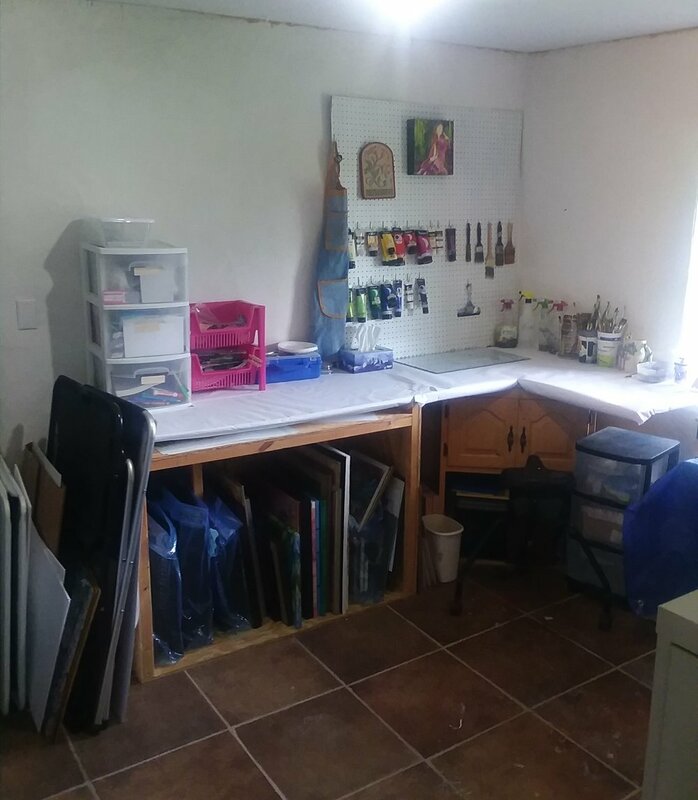 Since January of this year I have known that I needed and wanted to do a deep cleaning, de-cluttering and re-do of my art studio. My daughter Sophia had helped my husband and me de-clutter the other rooms of our home. But my studio was left as it was. Despite my wanting to tackle my cluttered studio... I was not having much success. I would walk into my studio and sigh. I would pick up a few things, clean off a few surfaces but never dig deep and get into the work of de-cluttering. That all changed when I was given the opportunity to be interviewed on video tape in my studio. Now I had a deadline and motivation. Even though I had a deadline, I felt completely overwhelmed. Where should I begin? My art mentor Matt Tommey gave wise counsel in one of his live question and answer sessions. He stated that the best way to organize a cluttered room is to take everything out and only put back what you need and use. That made sense. I had been praying and asking God to help me with this endeavor. During one of my prayer times, I was given a vision of how God saw my studio. He saw my process of painting as entering His throne room. That really got my attention and gave me a picture of what my studio could look like. It was that vision that got me started with the work of transforming my studio from a place of clutter to order and beauty. It is that vision that kept me going when I felt tired and overwhelmed. If my painting process was like entering the throne room, I wanted my studio to reflect that reality. I began by focusing on portions of my art studio at a time. I would take everything out of the room in that particular space of my studio. I then combed through everything and decided what to keep, what to throw away and what to give away. I found some great supplies that had been hidden and also got rid of a lot of old supplies I was not using. I even had a give-away of one of my older paintings. Since I was taking my time and really getting into every nook and cranny, I decided to paint my walls and paint my shelves white. 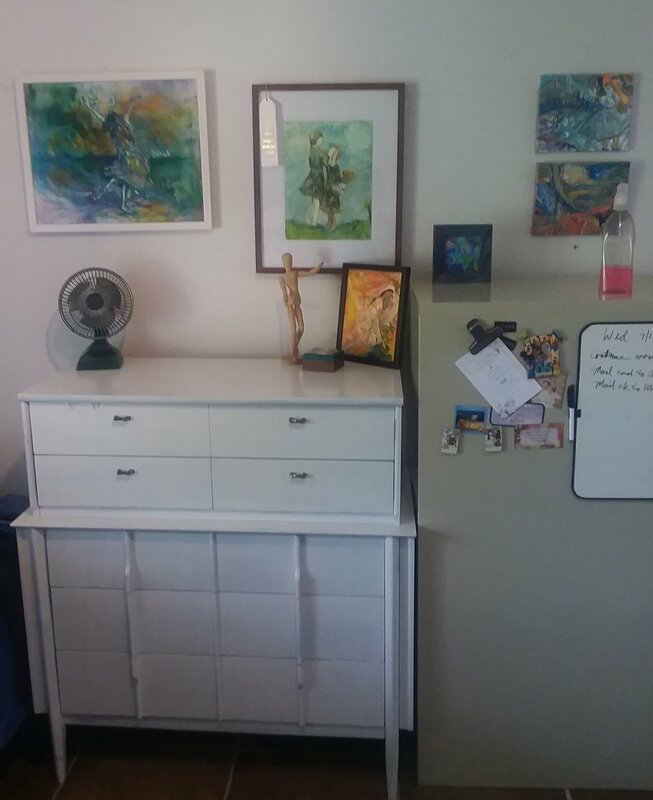 I found some great buys of a file cabinet, white book case and dresser that I incorporated into my "new" studio. Here is one section of my studio after it was de-cluttered and cleaned. Besides finding old and un-used art supplies, I discovered that I really enjoyed coming into a studio that was roomy, clean and in order. It made creating in that space more enjoyable and easier. I wanted to be in that room, even if I was not painting. I enjoyed just going in there and looking at how beautiful everything looked. I found myself cleaning up after I painted and putting everything back where each item belonged. The transformation had not only happened in my studio... it had happened inside me. My mindset was changing about how I saw my workspace and how I saw myself as an artist. By cleaning out my studio and examining every item I had, I was forced to examine myself. It's never too late to get rid of things that don't serve us anymore. It's never too late to get rid of old habits that don't benefit us. Is it easy? No, but it is definitely worth it. Time will tell if I will continue to keep my studio clean. I believe I will because the benefits I experience are greater than the little bit of work it takes to put things where they belong. I had to face the fact that my studio was a mess! I was running out of places to hide things in my studio. Having a vision of what my studio could look like was key. I kept returning to that vision when I felt overwhelmed. My studio looked worse before it started looking better. In the end, I'm so glad I did the work of transforming my studio. If you have a room that you want to transform, it can be done. It may take some time. My studio took 2 weeks! If I can do it, so can you! Here is to a new transformed room and new transformed you! The dresser was purchased for $6 at a local thrift store and painted white. I now keep prints, and unframed paintings there along with a few other items.